MOSCOW, Russia (CNN) -- Any attempt to pardon Mikhail Khodorkovsky -- once Russia's richest man, now its most famous inmate -- must follow standard procedure, including an admission of guilt, the nation's president said Sunday. Mikhail Khodorkovsky, once Russia's richest man, is imprisoned in a work camp 4,000 miles from Moscow. "Concerning the possibility of a pardon for someone, Khodorkovsky or anyone else, the procedure has to be carried out in accordance with our country's rules," President Dmitry Medvedev said in a transcript on his Web site. "In other words, a person must appeal to the president, plead guilty to having committed a crime and seek the appropriate resolution." The president dismissed talks of a pardon, saying, "at this point, there is nothing to discuss." Khodorkovsky once headed the Yukos oil company, once Russia's largest oil producer. He is serving a nine-year sentence for fraud and tax evasion. Medvedev described corruption as a "very serious Russian disease" and emphasized the need to fight it. "To this end, we have enacted a number of measures, including new legislation on corruption and special arrangements relating to government officials, their disclosures, declarations of income and so on," he said. "We are determined to continue this work, because we believe it is extremely important." The former oil magnate is incarcerated in a work camp near the town of Krasnokamensk, 4,000 miles (6,500 kilometers) from his native Moscow. He has been imprisoned since his arrest in 2003. Khodorkovsky had expressed a desire to run for office at the time and funded opposition political parties. He said the trial was part of a Kremlin campaign to destroy him and take the company he built from privatization deals of the 1990s. The Kremlin denied any role in his downfall. Yukos, which has since been crushed by a $27.5 billion back-tax bill, has been the object of a lengthy campaign by prosecutors and tax authorities. 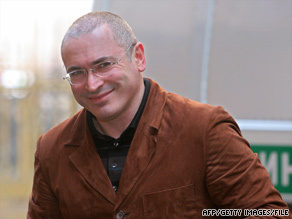 The court also ordered Khodorkovsky and his partner to pay about $600 million in back taxes.